beautiful aesthetics, advanced engineering and ease of use, they prove to upgrade your rooftop bar to a place everybody wants to stay - no matter if it is rainy, windy or sunny. The variety of customization is endless and therefore guarantees to perfectly blend into the individual vibes of your rooftop bar. Here is some inspiration for how your rooftop terrace could look like. Our experienced rooftop designers are happy to assist you in realizing your dream rooftop bar. 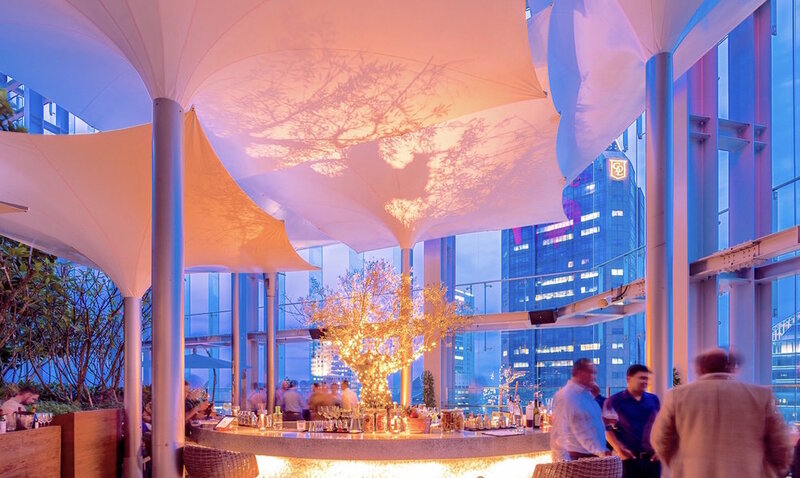 Located in the heart of downtown Singapore you will find our most iconic model, the Tulip umbrella, on display at the trendy rooftop bar of the Artemis. With the installation of our umbrellas, this 40th story rooftop bar has been transformed into an inviting and exhilarating space for their clientele. The Tulip will not only impress with its stylish design but with its functionality as well. Our umbrellas are fully collapsible and reinforced with a 100% aluminium frame that can withstand up to 60, 80 or 110 km/h winds. They can be customised to the proper height and shape to fit any space. The innovative Tulip design will not only protect against harsh UV rays but rain as well allowing it to be collected and funnelled through the umbrellas drainage system. Our integrated LED lighting systems will enhance the ambience. MDT has operated for over 25 years and is an industry leader in sun shading solutions. We are excited to be able to bring our innovative German designs and high quality products to the Australian and Asian markets. We know we can provide our customers with an aesthetically pleasing and highly functional product. For enquiries, please feel free to get in touch with us at our regional office based in Perth, Western Australia. Only the best umbrellas and shade structures for the valuable moments in life. A spectacular 270 degrees panoramic view of the Marina Bay skyline is one of the many things that draw the crowd to Zafferano. The Italian Restaurant is a remarkably high praised and also highly visited and forms the crown to the Ocean Financial Centre, 43 storeys above Collyer Quay, located in the heart of Singapore’s CBD. Zafferano is a perfect venue offering an unforgettable taste of all-round Italian hospitality – beautiful food, impeccable service, enjoyed within a convivial ambience. The elegant MDT-tex tulip umbrellas in all white finish were installed to create a smart solution in combining modern functionality and stylish design. The tulip umbrellas are fully collapsible and reinforced with a 100% aluminium frame that can withstand up to 60, 80 or 110 km/h winds. They can be customised to the proper height and shape to fit any space. The innovative Tulip design will not only protect against harsh UV rays but rain as well allowing it to be collected and funnelled through the umbrellas drainage system. Our integrated LED lighting systems will enhance the ambience.